Glide through a fashionable day in this dressy Cheetah slide from La Plume. 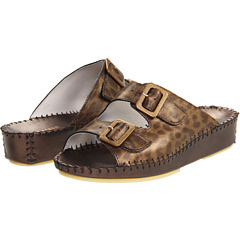 Snake print leather uppers provide exotic style for the fashionista in you. Dual adjustable instep straps accommodate various foot types for a personalized fit. Leather lining conforms to your feet in breathably soft comfort. Contrast leather wrapped footbed and mid-sole features whipstitch construction for added flexibility. Rubber forefoot and heel outsole provide added traction and durability. La Plume shoes take a fresh, fashionable approach to comfort shoes. Featuring a unique whip stitching developed by owner Paul Weitman, La Plume shoes have a distinguished appearance and should be considered a piece of fine art for your feet. La Plume shoes are hand sewn in Italy using only the finest quality leathers. Lightweight and flexible, La Plume shoes will enhance your life with personal comfort. La Plume shoes are fun footwear that add a stylish twist to any casual outfit. Go ahead and pamper yourself with an amazing pair of La Plume shoes.